Please note: The remaining balance will be charged 4 weeks prior to arrival. Payment link of the remaining balance will be send to you by email. Please note that a service fee of 3% will be applied. If the remaining balance is not paid within this timeframe we cannot guarantee your reservation! Festanation Oktoberfest Camp #2 - The newest and hottest festival campsite at Oktoberfest hosted by the Festanation family! We offer basic dorm & private tents for backpackers, including sleeping gear such as an airbed & sleeping bag. The campground offers good camping facilities with a number of clean shower & toilet blocks, a souvenir and costume store, WiFi access, a restaurant & bar. There are lockers to store your personal belongings (limited available). You can use your own padlock or buy one at the store. We also offer free Oktoberfest-tours! Our camp is located in the München Riem area. It is a quiet, green and countryside atmosphere. The cosy & fun camping paradise is conveniently located close to a train stop which will take you to the Hauptbahnhof in about 20 minutes (excluding walks to stations). 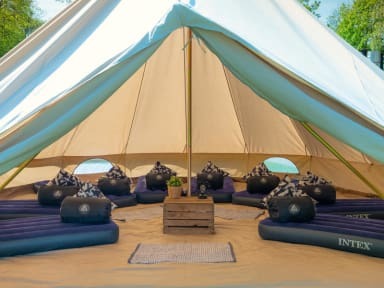 The Festanation crew will check you in with a big smile on our faces upon arrival, where the tents will be waiting for you already set up, including thick comfy air mattress and sleeping bag. On departure day you just take out your stuff and we clean up the mess for you! We have our own common breakfast area, including a nice terrace with picnic tables. Further, there is an actual big wooden party-chalet that holds the campsite bar. Here you can get tasty German beers, play beer pong & other fun games and obviously party before and after Oktoberfest. In the morning a simple, tasty breakfast & hot coffee will be waiting for you and your (new) friends. Enjoy your breakfast at our picnic tables in the sun and make a new game plan for the day! What is the Festanation Camp about? - A cosy, fun & clean camping paradise for travellers from all over the world. 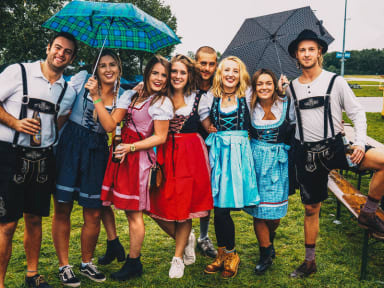 - A wild, social and unforgettable Oktoberfest experience. - The place to get a crew together for the Oktoberfest. - Free tours to Oktoberfest. - Everything you need is provided; tents, air beds, sleeping bags, pillows and more. - A tasty breakfast between 8 and 10 is served every day. - Fun and lively beer-chalet at the campsite to pre and after party! - We offer basic private tents and basic dorms with sleeping materials. - The camp offers shared bathrooms & warm showers. - Limited amount of lockers to store you valuables. You can use your own padlock. - The campsite has WIFI available, which can be purchased. What is the Festanation Camp not? - A 5 star hotel. If you don’t like or even hate camping, think twice! - Don’t come for just a cheap bed, you won’t enjoy it. Come for a fun experience, to make friends and to get wild! - Always sunny and bathing-suit-weather. Sometimes the sun is out and it’s perfect, sometimes it can rain and get cold. Therefore, bring warm clothes and hug many as many people as needed to stay warm! Cancellation policy: 14 days. Failure to cancel within this time will result in a cancellation charge equal to total amount of your reservation. No-show policy: Not showing up without cancelling your reservation will result in a no show charge equal to the total amount of your reservation. Payment request of the remaining balance will be send to you by email. It is more secure and saves a lot of hassle for both if you settle your balance before arrival. However, paying upfront is not obligatory, payment upon arrival is also possible. We accept credit or debit card and cash payments. Administration cost may apply. There is also an ATM at the campsite but it charges high transaction costs. * Early check-in is available upon request to drop of luggage but the beds will not be available. We have a stand-bye night receptionist in our camp. If you arrive after 01:00, please inform us upfront, so we know you are still coming. ** Don't worry we won't kick you off the campsite at 10.00, you can still be part of the family until 14.00, then it is really time to go. Reception: 07:00 - 01:00 reception and 01:00 - 07:00 stand-by night reception. Group bookings have a 4 weeks cancellations policy. Failure to cancel within this time will result in a cancellation charge equal to the total amount of your reservation. Amazing experience. My friend and I stayed in individual tippis and I couldn’t have asked for a better glamcamping experience. We’re talking heater, thick blanket and tons of room to move around in. Lastly the staff was incredible I met numerous charming and friendly staff members. We felt extremely welcomed when asked to join in the staff group and join them for Oktoberfest festivities. Off the top of my head, Jose, Alex, and Zee I remember clearly went out their way to make sure I was happy. I stayed at Schnitzel Camp for the 2018 Oktoberfest. I had a great time at the campsite. The campsite has all the facilities you need and above all the staff is super friendly. Highly reccomended! I absolutely loved my stay at this Oktoberfest camp. Great atmosphere, fun staff and good breakfast. Lots of beers, beers and beers..well, that's Oktoberfest. Good times! The staff was by far the most helpful, kind, and fun-loving. They are what made staying here well-worth it. I had missed my flight the day I was supposed to check out and despite being fully-booked they somehow managed to secure me a another night. They even let me use one of their phones to book another flight back home since mine had no service. From the camp it was easy to get to Oktoberfest. Plus having free breakfast in the morning was so nice after partying all night before. Excellent crash pad for seeing Oktoberfest over a weekend. Great party crowd if you're looking for that. The mobile showers and bathrooms there were nice for a temporary campsite, very pleased by that. Hot water showers felt amazing after a crisp chilly night spent outdoors. The camp was a little far from the city center and Oktoberfest but a 15-20 minute train ride/walk in, or a 50-80 euro taxi ride (to airport too). Staff were very friendly. Food, drinks, music and dancing on site which provided a fun atmosphere. The first night was freezing cold in the sleeping bag/tent but the second two nights I stayed were fine but bring warm clothes to sleep in regardless. Bathrooms were clean. Great staff kinda hard to find the place as i was looking for the festivation camp but it was actually called the Weiss. Security is good for passports but not for phones all the charging stations are either open in the bar or in the check in tent (my phone went for a walk and never came back). The bar on site was very eventful and the staff was always ready to show you a good time. Breakfast was always great and the guided tour to the Oktoberfest ground really helped.